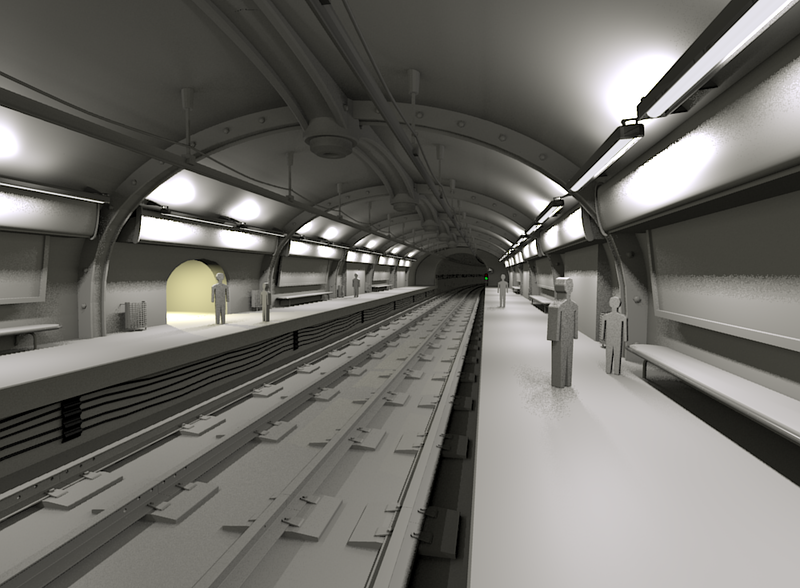 Here is an update of my subway scene. Added the (almost) final modeling touches to it, like a stop light, a mirror (way at the end of the station), electric cables, an entryway to the station. I finally fixed some issues I had with the Curve modifier. Besides making sure that everything in the object is set to default (0 location, 0 rotation, 1 scale,) one needs to make sure that the curve has the appropriate tilt applied to it. I had a couple of these that, for some reason, needed to be adjusted. The way to do this is by selecting the whole curve in Edit mode, hitting Control-T, and dragging with the cursor, or entering a value. Mine was rotated 90 degrees, which forced me to rotate the elements 90 degrees in Edit mode. Yikes! Not anymore. Please give a link for downloading your 3D project.i want to work for texturing that. oh sorry,i forgot to say project must be in obg or c4d please. Hmm let me think about that... Maybe I'll release it as open source.